"If a woman sees her friend wearing a dress she must have, there is no longer a cool-off period during which the purchase can be reconsidered," says Dominik Mazur, CEO of Image Searcher, co-developer of the CamFind app for iPhone and Android. "She can take a picture of it, have it up on screen within seconds and then instantly order through her favourite retailer." A visual search engine that allows users to snap anything they see and choose where to buy for the best price, CamFind is just one of a new generation of mobile apps that pounce on our impulses, aspirations and temporarily lowered inhibitions in order to liberate us of our income. While Britain's high street stores struggle to emerge from an apparently never-ending slump, the likes of Wanelo, Fancy, Etsy, eBay and Amazon are constantly working on new tools designed to ensure everything we've ever wanted (and plenty of stuff we didn't know we wanted) sits front and centre on those conjoined twins we've come to call smartphones. "We are all visual beings, so searching visually makes the most sense in my opinion and the trend will only grow," says Mazur, whose app has already processed 12m image searches in six months. The multi-talented CamFind, (think of it as a far superior and more useful version of Google Goggles) racked up a million downloads on iOS prior to its recent Android launch. You can snap a cup of coffee and it'll tell you where you can get a mid-morning Java thanks to Yelp integration, or a movie poster to get a screen time. There's also a barcode scanner for direct price comparisons, but that's old hat in this age. Image search apps like CamFind have been so successful that Amazon has just adopted its own interpretation. Called 'Flow', the feature uses augmented reality to scan objects and text. If a match is spotted within the inventory, the Amazon listing will appear. The idea is to give consumers an opportunity to get a better price. The execution isn't quite there yet, but the potential is. It's one of a series of ploys from the world's biggest etailer to ensure that even when the product is in the user's hand, they'll choose to buy it online. Free next-day delivery is already in place through Prime (two days in the US), and next it wants to send us items in half an hour via drones. After that it'll start sending us items we haven't even ordered yet thanks to predictive marketing data. If it was up and running now in rain-soaked Britain, we'd all be getting new wellies in the mail. However, Amazon and CamFind's current play still relies completely on the user already knowing what they want. Other apps are taking every opportunity to show us what we don't know we want. "Visitors don't have any particular items in mind, but are very open minded. They're saying, 'I've got a bit of money to spend, show me what you've got, inspire me'." 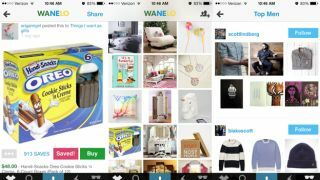 One app that captures the very essence of smartphone shopping is Wanelo (that's Want, Need, Love, for those keeping score at home). Part social network, part 'window shopping on steroids,' it is one of the most popular apps on iOS and Android, and a chart-topper on both platforms. Users follow their favourite stores, brands, influencers and friends to customise a shopping experience in which 9.5m products from over 200,000 stores are purchasable from within the app. It has a constant-scroll feed of interesting items, making it the perfect app for loafing at home or on the train.